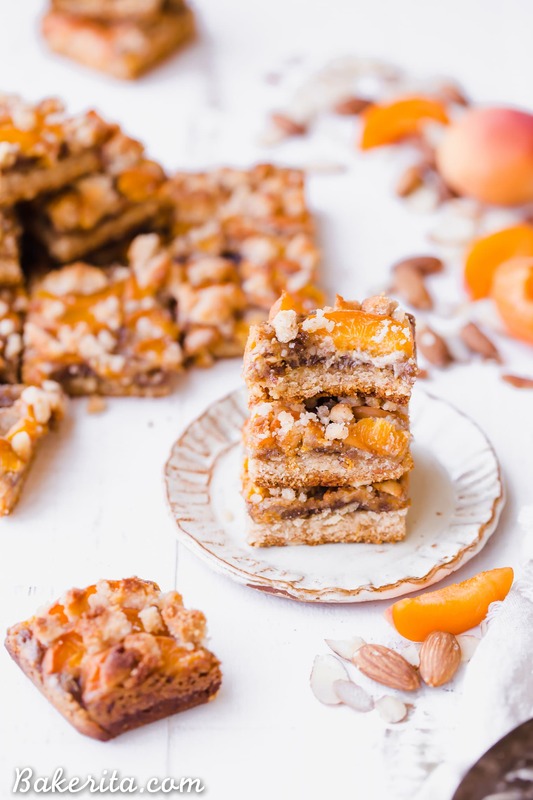 In these Apricot Frangipane Bars, apricots and almonds come together in the most delightful way – the shortbread crust is topped with an almond frangipane filling and topped with fresh, juicy apricots. These gluten-free, paleo, and vegan bars are irresistibly delicious. You can customize them with your favorite stone fruit, too! I’ve underloved apricots for most of my life. I don’t think it was my dislike of them, more a lack of exposure – we just never bought them, so they were never in the house. We always favored peaches, nectarines, and plums as our stone fruits of choice. To be honest, apricots were never the star of the show when it came to comparing all of those fruits. They always seemed the blandest. BUT last year – I tried apricots from the local farmer’s market and fell in love. They were so much juicier and sweeter than I remembered! At the time, my boyfriend at the time and I had borrowed his mom’s dehydrator and were dehydrating tons of farmers market fruits to see what was the most delicious. One day we threw a couple apricots halves on there and OMG. We both became obsessed. So recently, when I was asking on Instagram about what kind of fruits you guys wanted to see in desserts this summer, someone messaged me and suggested an apricot crumb bar. These Apricot Frangipane Bars immediately constructed themselves in my mind – I had to make them soon. So I gathered some fresh, delicious apricots from the farmers market and brought them to life. They were just as good as I envisioned. 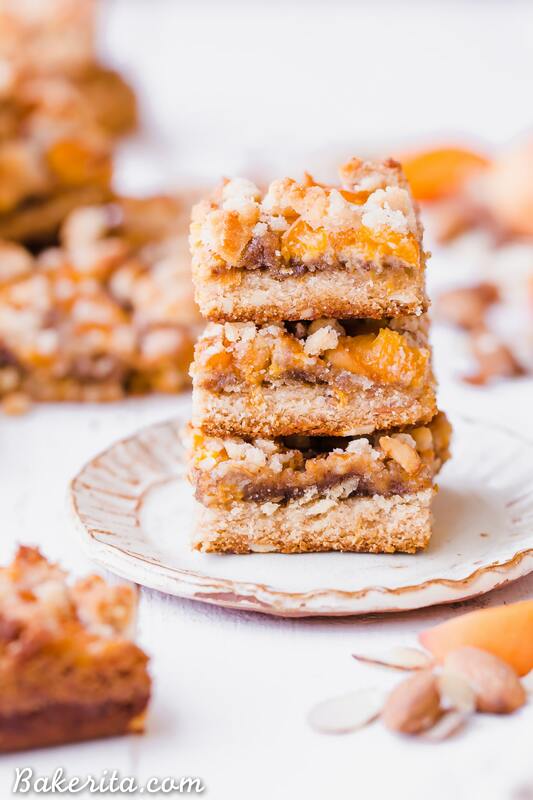 These Apricot Frangipane Bars have a thick, shortbread-like almond crust with a layer of almond frangipane on top, apricots arranged all over the top of the frangipane, and then some extra crust crumbled over everything. The apricot and almond flavors pair together so wonderfully, and it’s a delightful combination of textures. Since the crust and crumble are the same, it doesn’t take long to make either! The longest part for me was arranging the apricots…and since the slices are covered in crumble anyways, you certainly don’t need to be fancy about it like I tried to be (before I remembered you’d barely be able to see it…). Of course, if apricots aren’t your jam, or you just have some other stone fruits around the house you want to use instead, go for it! You can vary the fruit pretty easily here to make it your own :) have fun with it, and enjoy!!! 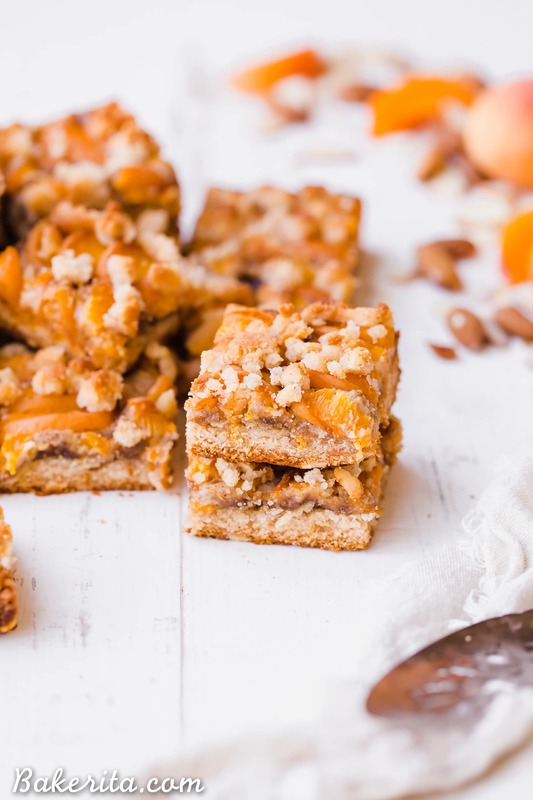 In these Apricot Frangipane Bars, apricots and almonds come together in the most delightful way - the shortbread crust is topped with an almond frangipane filling and topped with fresh, juicy apricots. 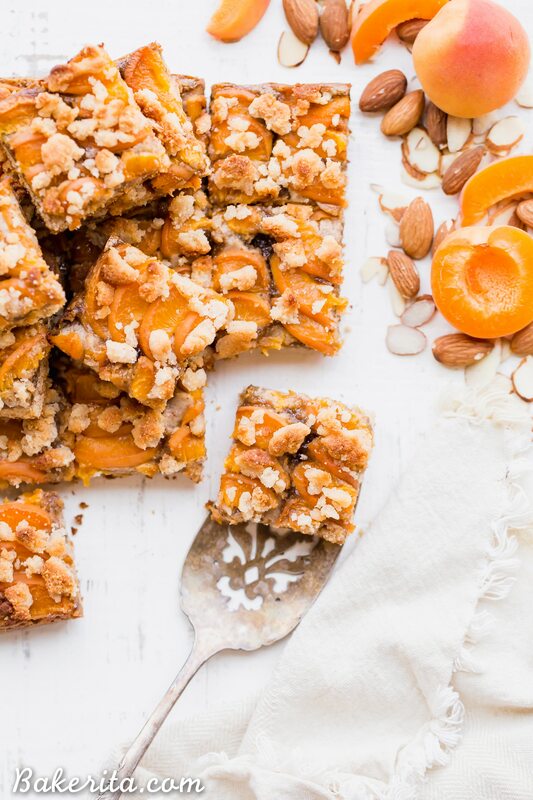 These gluten-free, paleo, and vegan bars are irresistibly delicious. You can customize them with your favorite stone fruit, too! In a mixing bowl, combine the almond flour, coconut flour, chopped almonds, maple syrup, almond butter, and coconut oil. Stir until the dry ingredients are completely moistened and crumbly. Press 2/3 of the crust into the prepared pan, reserving about ¼ cup for the topping. In your food processor or blender, grind the almonds, tapioca flour, salt, and coconut sugar to a powder (or as fine as you can make it). Add the coconut oil and process until no longer visible. Add the egg and vanilla, blending until completely incorporated, and a smooth paste is formed. Spread the filling evenly over the almond crust. Arrange the apricot slices over the almond paste as desired. Sprinkle the remaining crumble on top of the bars. Bake for 40 minutes, or until set and a skewer inserted into the center comes out clean. Let cool completely before cutting into squares. Store in the refrigerator for 3-4 days or in the freezer for a few months. This is such a great reminder to try buying fresh apricots! I buy dried sometimes but not fresh as often….I agree they are an underrated fruit! Aren’t they?! Thanks for the love, Brittany! Silly question–but do the apricots need to be peeled? thanks–can’t wait to make this as I walked into my local market and apricots were right there to buy! 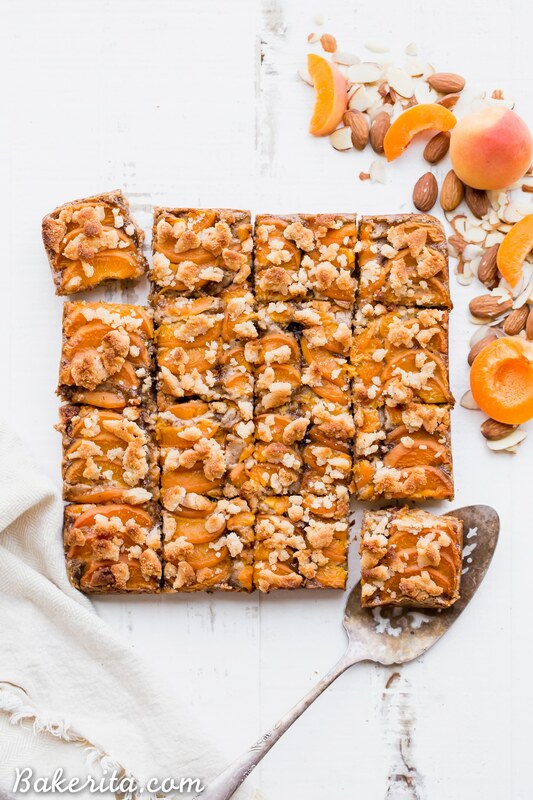 Gorgeous bars, I love all those pretty apricot slices! Thanks so much for the love, Laura!! I just made these and even though I had to make some substitutions-I wasn’t at my house and didn’t have some ingredients –they were so delicious! I’ve frozen some to enjoy later–yummy! Thanks for this lovely recipe. So thrilled you’re enjoying them! Thanks for your feedback Kathy.